"The Boy Who Can Connect Anyone's Heart With His Own..."
It's almost obvious it's referring to Sora. Based on the other lines AtW gives, it looks like Sora's destined for even greater things in the future. I recently read a theory at GameFAQs that suggested MX (Master Xehanort) and Vanitas are playing both sides of light and darkness to fulfill and bring about Sora's predestined fate for their own gains. Anyways, the point of the theory was that Sora's been along time coming, and his role in the series is something of epic proportions. Re: "The Boy Who Can Connect Anyone's Heart With His Own..."
Well, his Dive to the Heart DID tell him that he was the one who was going to open the door, even though Riku was supposed to be the Chosen Wielder. And I think it's been suggested by Nomura that Sora was meant to have a Keyblade too, he just wasn't supposed to be the first. For me, that raises all sorts of questions about Riku's importance as a Keyblade wielder vs. Sora's. Because if Sora's had this great destiny waiting for him all this time, why was Riku supposed to be the Chosen One? Did Terra really pick him? How'd that work anyway? Did Terra pick the wrong person, and the Keyblade was really meant to go to Sora all along? Depending on how Terra choosing Riku works, and whether or not a Keyblade can really be passed on from person to person that simply, I'm thinking that if you're right D&C, then Terra might've very well picked the wrong person. Both boys have strong enough hearts to wield Keyblades, but Sora was always meant to be the Hero of Light. I've often thought (ever since I first played KH1) that Sora was really the one meant to get the Keyblade. And when the LS fight emerged in KH2FM+, most took it as confirmation that Riku was meant to get the keyblade, but I took it as evidence that for my theory, in a very different light. As you said, what if Terra picked the wrong person? Remember the vital detail mentioned in KH1: The keyblade chooses its master, not the other way around. So technically, Terra couldn't have really made the choice as to who would get the Kingdom Key. The KK itself makes the call. However, as we all know, Terra has connections with Maleficent in BBS. And Maleficent knew in KH1 that Riku would be able to summon the KK. There's only one way she could have known: Terra told her. Unless Maleficent was lying and she had no idea whether the Keyblade would work for him or not; she only wanted to give Riku an extra motive to take out Sora? Or she saw similarities between Riku and Terra and made assumptions? But I'm glad you like that idea! The newest trailer certainly shows Terra taking an interest in Riku and Riku talking about a desire to become stronger, so perhaps from their conversation, Terra realized that Riku had the makings of a great wielder, but didn't get the same vibes from Sora. I mean, Sora isn't Kairi's lazy bum for nothing! However, we know from the series that Sora is a great Keyblade wielder, and I think you've brought up an excellent point about the Keyblade being the one who makes the call. I really want to play BBS now so I can see how this works. True. And that's a possibilty/plot hole I'm thinking is very likely to happen. Could be. After all, Maleficent IS smart. Arrogant and blinded by her own goals and the darkness, but nevertheless smart. Of course!!! And of course, Ven is probably somewhere in this equation too, so I think we'll know for sure in a few weeks, as far as the Keyblade is concerned. I wonder why so many people forget that. It's always been something I think about. But then again, my mind does think differently than most. 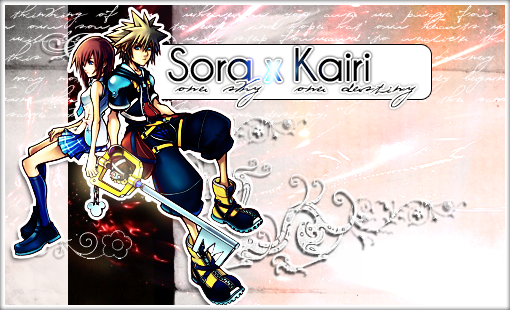 But I agree, keyblade or not, Sora was always destined to be the Hero of Light. VirgilTheart wrote: I wonder why so many people forget that. It's always been something I think about. But then again, my mind does think differently than most. I've honestly never thought about it until now, but the more you talk about it, the more it makes sense, and the more confused I get about the idea of Terra being able to choose someone. It's like when people say that because Kairi's Keyblade came from Riku, Kairi can't wield a Keyblade. But I don't think a character could force a Keyblade to stay in someone else's hand. Furthermore, I was just rewatching the newly released BBS trailer, and there's a part when Ansem the Wise talks about a boy who can "open that door." The only person whom anyone's ever referred to as being the one who will open a door is...Sora. I think you're on to something here, D&C. *Bows yet again* Thank you. And that could mean Kairi will get to use her keyblade again in KH3!!! And you're right: Only one character has been said to be "the one who will open the door..." and it's Sora. It's one of the first lines in KH1, and it's the last line too. In the epilogue in the field, it ends reading: "Remember Sora, you will be the one who will open the door to light..."
And doesn't the mysterious voice say something like that right before you enter the door to fight Xemnas in KH2? Only in that instance, everyone went through, and it wasn't the door that KH1 refers to. Yeah, I seriously doubt that Sora's job is finished. Kingdom Hearts is his story; therefore, as long as the series continues he must have more work to do. Yep. And although I'm not fond of how Coded ended right now, I can see the next step of where his work will be: The digital world that formed at the end of Coded. Or so Lissar of KHI says. Plus, AtW mentions "freeing those poor, tortured souls" so I think that'll be something important in KH3. I'm REALLY not happy with the way Coded ended right now! It's one of those things that absolutely requires a sequel, and I hate how it ended without answering any questions! But I'm predicting that Mickey will decide to send the real Sora into the data world, and that's what the letter from the King was about at the end of KH2. Then, they will discover something very important that becomes the conflict in KH3. That's my theory anyways. And we still don't know who those "poor tortured souls" are! Arrgh! All I know is that it reminds me of Ursula's song! My guess is either TAV, the souls of those who became Unversed (don't ask why) or the Nobodies and Heartless. Sadly it does remind me of that song... HATE that movie, personally. I rewatched the trailer (for the uptenth time. ) and noticed some of the other things AtW said. That "the world has come close to falling into darkness many times. And every time, a boy wielding a keyblade rises to save it." and I can't help but think of Sora's liberating Hollow Bastion in KH1. But I wonder what world they might be talking about. It COULD be Radiant Garden, in which case Sora has done multiple times, or it could be an entirely new world that Sora will have to go to in KH3. Thoughts? It's pretty much CONFIRMED that Sora and Ven are connected. If memory serves me right, it was confirmed that the voice Sora heard was King Mickey. Don't quote me on it. And I think it was only him when Sora approached the door at End Of The World right before the final boss. Again, could be wrong though. Well, from the secret ending, it seems that Sora, because of Ventus's heart, has links to Terra and Aqua. If I'm assuming correctly, Sora gets to save everyone, and finish off the Heartless once and for all, while learning about his destiny. BTW, I can't stand Kairi's Japanese voice. Hayden Panettiere and Alyson Stoner were so much better.